Patwadi or Patodi, is similar to the ever-famous Gujarati “Khandvi”. Made with gram flour and buttermilk, this dish is absolutely delicious as well as healthy. Quick and easy this makes a great pick for those days you crave for a side dish with your lunch/dinner. This can also be served as a snack with tea or coffee. The perfect blend of spices, buttermilk and gram flour gives thisPatwadi a delicious mild flavor that’ll leave your family asking for more. The grated coconut and coriander adds a twist to the Patwadi , making it further mouthwatering. Looking for similar recipes? Check these out: Patodi Rassa Recipe, Suralichi Vadi Recipe, Palak Vadi Recipe, Kothimbir Vadi Recipe. In a mixing bowl add gram flour, water, butter milk, red chilly powder, turmeric powder, 1/2 tsp green chilly paste mix well and make fine batter. Heat oil for tempering add mustard seeds, asafoatida, remaining ginger garlic and green chilly paste and pour the gram flour mixture on it. Mix it well, it should not stuck at the bottom of pan. Grace plate with little oil and pour mixture and spread the mixture. Sprinkle fresh grated coconut and coriander leaves on it and cut them into square shape. 1) In a mixing bowl add gram flour, water, butter milk, red chilly powder, turmeric powder, mix well and make fine batter. 2) Heat oil for tempering add mustard seeds, asafoatida, ginger garlic and green chilly paste and pour the gram flour mixture on it. 3) Mix it well, it should not stuck at the bottom of pan. 4) Grace plate with little oil and pour mixture and spread the mixture. 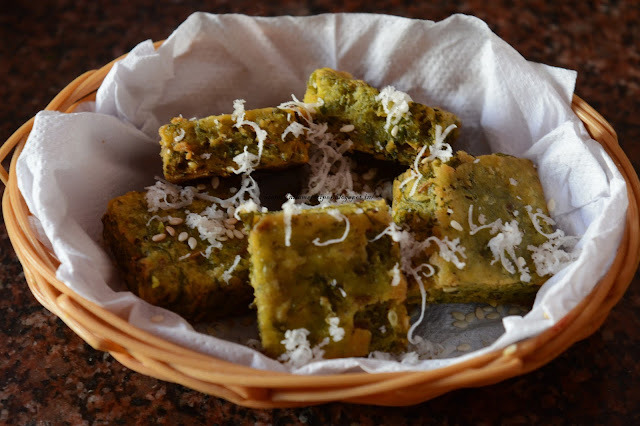 5) Sprinkle fresh grated coconut and coriander leaves on it and cut them into square shape. 6) Serve them as a side dish. We really love your web site, it has unique articles, Thank you!